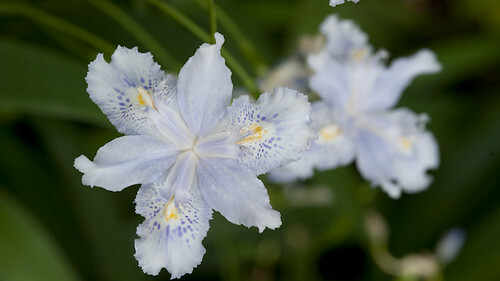 Iris confusa is a delicate iris from south-central or Western China. 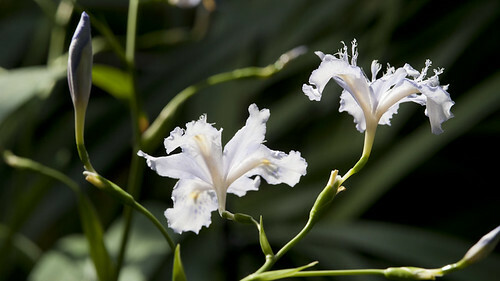 The photograph above shows Iris confusa in the temperate house at Kew where the flowers pay closer inspection. 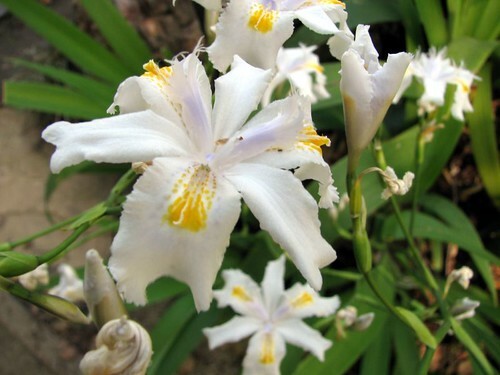 Iris confusa is an evergreen, upright perennial with fans of mid-green, sword-like leaves. The plant’s broad, shiny leaves are attached to the ends of bamboo-like stems up to 2 feet long. The bamboo-like stems will eventually lie flat and root, thus forming good clumps. The Iris confusa flower in spring and early summer April – June. Each flower is lavender to pale blue or near white with yellow or purple spots. Iris confusa ‘Martyn Rix’ is a popular variety of Crested Iris with white flowers, yellow crests and purple dots on the falls.